eteaket has just turned 10 so we’ve revamped our Tea Room and would like to invite you to our birthday par-tea. 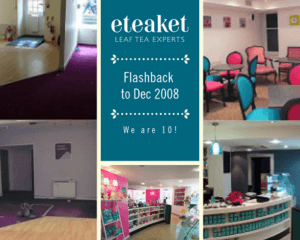 It’s a little over 10 years since I opened the doors of the eteaket tea room on 16 December 2008. Boy, a lot has happened in 10 years. 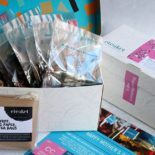 We’ve grown our wholesale tea business and now specialise in supercharging tea service in foodservice businesses; we’ve opened our Concept Store in central Edinburgh; grown our online ecommerce site where we spread the joy of tea all over the world; we’re exporting some tea overseas and, of course, have grown our team and our amazing tea tribe of fabulous tea lovers and had two children and two guinea pigs. I got a little carried away a few months ago and wrote some words on the lessons I’ve learned over the past 10 years. You can read that here. It’s a little long, but I find writing is far cheaper than therapy. 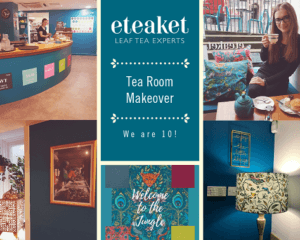 In this message, I wanted to tell you all about our recent Tea Room makeover to celebrate eteaket’s 10th birthday and to invite you all to a tea cocktail par-tea. I’ve been desperate to revamp the space for ages but I had to play the cat and mouse/ tenant and landlord game for most of last year. Talk to me about that in private because it wasn’t pretty. However we came out the other side stronger than ever (as with most challenges). I stupidly set a date of 14 January to shut for a few days to carry out the work. Then we were so manic over Christmas that no-one had any time to plan what we were actually going to do. It was only after Christmas that I got a breather and realised most places were closed till 7 January, giving us a week to sort out a whole refit. There seems to be a 10 year challenge sweeping social media where everyone is posting pics from 10 years ago and the present. Perfect timing then for some before and after shots to celebrate. I really hope you like our new look. 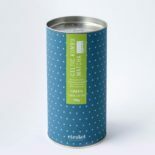 We used some fair trade furniture from Myakka sourced from India (as a lot of our tea comes from India). 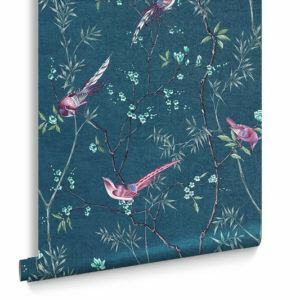 Our modern brass lights from Pooky are reminiscent of colonial times mixed with some colourful jungle fabrics from Clarke and Clarke and of course our tea Chinese bird wallpaper (as a lot of our tea comes from China) from Graham & Brown. 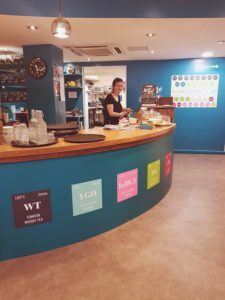 As with all events, there are a huge amount of thanks due… In no particular order I can’t thank Renee enough for her skills and tenacity and we simply couldn’t have done it without the immense effort from Kevin Doust and his team from Clandoust who did all the re-fit work including laying the floor. Kev and his son even ended up working all through the night one night to get the job done. I have no words! Then there’s Mira from Mira’s Alterations in Portobello for making all our cushions and Josh from Craig & Rose in Stockbridge for sorting us out in the paint department. 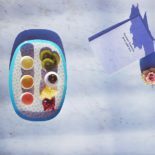 I also cannot thank every single one of the eteaket team enough for all their amazing cleaning efforts and going the extra mile as usual! 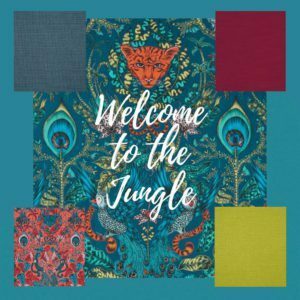 A huge thanks is also due to the wonderful Zoe from Firefly in Edinburgh for making our jungle lampshade, to the guys at The Foam Centre in Edinburgh for helping us in the foam department, Mac Sharpe Upholstery in Tranent for redoing our couches and the guys at Black Box Edinburgh for doing our counter vinyl. 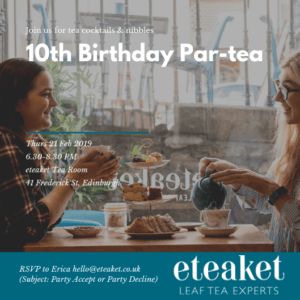 Finally, I’d like to invite our fabulous supporters, customers, suppliers and interested parties to our 10th Birthday Par-tea on Thursday 21 Feb 6.30-8.30pm in our revamped Tea Room, 41 Frederick St Edinburgh. Please rsvp to me [email protected] with subject Party Accept. There will be tea cocktails and nibbles so we look forward to seeing you then if not before. 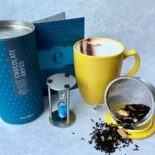 This entry was posted in eteaket team Events Tea Room and tagged edinburgh, interior design, Makeover, tea room. Bookmark the permalink. Delicious Cold Brew Recipes… The Warmer Weather is here! Happy Easter! The TEA-ster bunny has arrived!